Even Finish Masks Volatile Year For U.S. Economy Stocks ended up around close to where they started the year. Markets were mostly unfazed by the U.S. debt downgrade. But big changes in the European economy and governments in the Middle East made for a tumultuous year, when what sent the market into a tailspin often took place overseas. 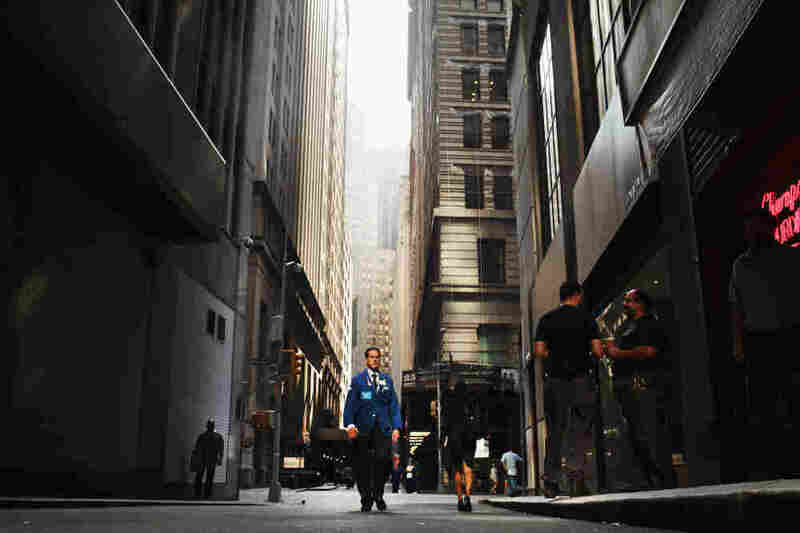 A trader walks in New York City's financial district on Sept. 12, a day when stocks fell early based on fears that the Greek government would default, then rallied on news that China might buy Italian debt. This year, what sent the market into a tailspin often took place overseas. 2011 was a year of crisis and revolution, and that took a big toll on the world's financial markets. In the United States, stocks lurched along for much of the year, losing and gaining ground over and over again. Stock prices are ending the year just about where they were at the beginning, and anyone who invested in anything but the bluest of blue chip stocks probably didn't make much money. And yet, the flat trend lines masked a huge amount of volatility, says Jack Ablin, chief investment officer of Harris Private Bank. "In many respects, this last year is sort of a microcosm of the last decade in that we've gone up and down and ended up sideways," Ablin says. "[There was] a lot of emotion — a big roller coaster — and end to end, we're not going very far," Ablin says. Like 2008, this was a year when the stock market had more than its share of stomach-churning days of the Dow Jones industrial average rising or falling by triple digits. This year, what sent the market into a tailspin often took place overseas. "There was an awful lot for the markets to deal with this year, and that did cause an awful lot of volatility in the market and ... some big slumps," says David Kelly, chief market strategist for J.P. Morgan Funds. In March, Japan was struck by a deadly earthquake and tsunami that slowed the country's industrial base to a crawl. Because a lot of parts for cars, cameras and television sets are manufactured in Japan, the impact was felt around the world — including in the United States, where auto sales dropped off. Meanwhile, the debt crisis that has plagued Europe for two years intensified. In Egypt, Tunisia, Yemen and Libya, protesters succeeded in driving longtime autocrats out of power, but the chaos and uncertainty drove oil prices higher. 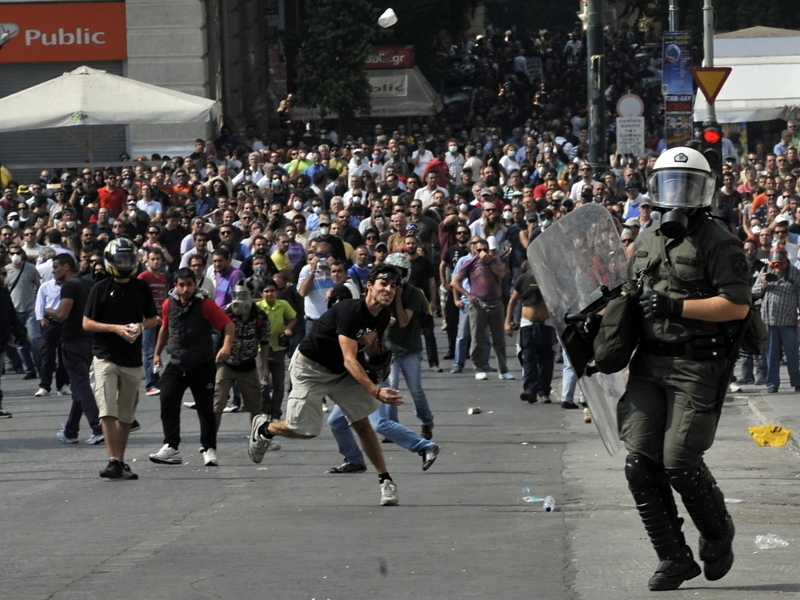 Anti-riot police clash with Greek demonstrators in Athens in October during a protest against deeper austerity cuts, as the debt crisis in Greece and the rest of Europe intensified this year. Gold and U.S. Treasury debt were also up. But in August, Standard & Poor's downgraded U.S. debt for the first time after a crippling fight over whether Congress should raise the debt ceiling. President Obama was one of many who warned that the stalemate in Washington would have negative consequences. "It's pretty likely that the uncertainty surrounding the raising of the debt ceiling for both businesses and consumers has been unsettling and just one more impediment to the full recovery that we need," Obama said in a speech in August. But the debt markets seemed to shrug off the downgrade, and the interest on U.S. debt kept falling. Investors didn't seem all that worried about the U.S. fiscal picture, according to David Kelly. "It's not like Standard & Poor's told investors anything they didn't already know, so when [they] downgraded the United States, that really didn't change people's perception of the creditworthiness of the U.S. government," Kelly says. "[And] then the Federal Reserve stepped in to say, 'We're going to support low interest rates in a variety of other ways.' "
With all the threats hanging over the economy right now, U.S. Treasury debt still seems like a safe haven. And as Europe heads toward what looks like a recession, the clouds are parting a bit in the United States. "There's starting to be somewhat of a disconnect: We're getting good, solid economic numbers here at home," says Ablin with Harris Private Bank. "They're still having their issues, they're still having their meetings and they're still having their debates." But Ablin says as the New Year approaches, there are still big threats out there that keep him up at night. One is China, which has benefited from an enormous infrastructure boom. "Sure, they need roads, they need bridges, they need trains, they need airports, but I'm not sure they need all of the construction that's been going on, and they're obviously building towers that are empty," he says. "Eventually that's going to catch up with them." And a big slowdown in China would be felt in all the countries that sell it products and commodities, including the United States. The U.S. has become more closely tied to the world economy than ever, and as the events of this year have underscored all too well, what happens overseas can have a big impact on money that's invested at home.